GDF SUEZ Energy Resources recently announced a donation of $15,000 to the Sustainable Enterprise Partnership (SEP), in addition to a $10,000 donation to the Syracuse Center of Excellence (SyracuseCoE). 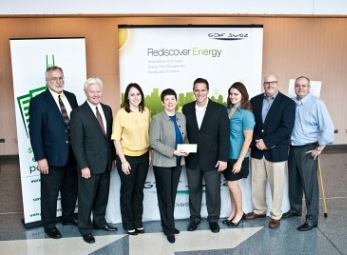 The checks were presented at the SyracuseCoE Symposium 2011. The SEP is a collaborative effort involving faculty and researchers from four partnering institutions—Syracuse University’s Whitman School of Management and L.C. Smith College of Engineering and Computer Science; the SUNY College of Environmental Science and Forestry; and SyracuseCoE. The SEP provides world-class education and research on sustainable enterprise by leveraging the academic, public and private sector resources of Central New York and beyond to address this significant and growing area of concern for businesses and other organizations. SU recently signed a new contract with GDF SUEZ to provide electric commodity through the 2014 fiscal year. This contract will provide the University with electricity rate savings over the duration of this three-year contract. In addition, the GDF SUEZ has chosen to support selected SU programs related to energy and sustainability, such as those in the SEP and SyracuseCoE. The gift to the SEP will provide scholarship funding to support students that have already begun the Certificate of Advanced Study in Sustainable Enterprise (CASSE). CASSE is an advanced certificate program for full-time SU and SUNY-ESF graduate students that integrates business, science, engineering, policy and practice, and emphasizes transdisciplinary collaboration. GDF SUEZ Energy Resources NA is one of the largest non-residential retail energy suppliers in the United States and currently serves commercial and industrial customers in 12 markets: Connecticut, Delaware, Illinois, Maine, Maryland, Massachusetts, New Jersey, New York, Ohio, Pennsylvania, Texas and Washington, D.C. The company serves more than 73,000 customer accounts.